This is the last episode for the Blind Auditions of The Voice of the Philippines Season 2. The four coaches have already completed the list of 14 artists for their team and they are ready for the next round. But before that, let me just give you a quick summary of what happened during this episode. The episode started with a quick rundown of who entered in the Blind Auditions yesterday. The coaches were still looking forward to new artists who would like to complete their team except for Coach Sarah who was the first one to complete the list of artists. Tonight’s episode made it possible for the following artists to advance on the competition. Suy Galvez is 33 years old from Mandaluyong City who performed the song “What a Wonderful World” that made her land to Team Bamboo. Mackie Cao is another artist who decided to choose Coach Apl.de.ap. She performed the song “Listen” with a powerful voice. The 27-year-old Mic Llave who is Juris’ guitarist also advanced to the competition by performing the song “Panalangin.” He became a member of Team Lea. Casper Blancaflor, a song writer and daughter of two musicians advanced to the competition with her performance of Rivermaya hit “Kisapmata.” Bamboo became her coach who was able to sing with her. And the last artist who completed Team Lea was Emil Sinagpulo, a dedicated nurse who decided to practice his profession for his needy countrymen. Emil became a member of Team Lea and the coach was excited about it. Now that all of the teams have completed their list of artists, the more exciting part of the competition is at large. On the last part of today’s episode was a music video with all the artists who made it to the Blind Auditions of The Voice of the Philippines Season 2. More to come next week as the artists are bound to do their best in order to survive. 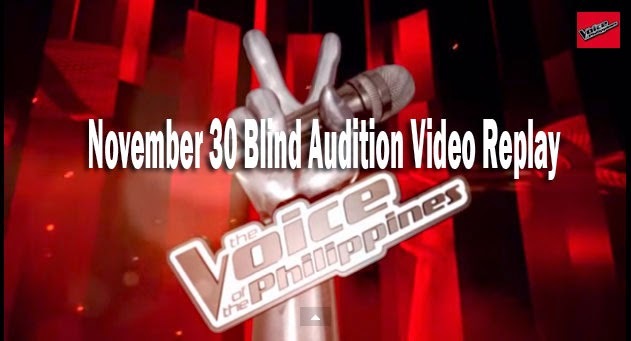 Bookmark and reload this page from time to time to see live update of The Voice of the Philippines Season 2 November 30, 2014 Blind Audition. Follow us on Facebook and Twitter.